We are still a long way from a comprehensive understanding of the phenomenon of 'safe-haven' currencies. And yet in times of low inflation and interest rate lower bounds, this is not a second-order issue from a monetary policy perspective. As Habib and Stracca (2011) argue, we all 'know' what safe-haven currencies are, implying that despite the recursive and pervasive nature of safe-haven flows, pinning down the exact determinants of such currencies is not easy. Nor is it straightforward to identify the exact triggers for safe-haven flows, or to track the ways in which safe-haven demand materialises. For countries whose currencies are considered safe-haven currencies, it is crucial to understand this behaviour – not least because it influences monetary policy. Large, abrupt swings in the exchange rate can cause dramatic, undesirable changes in monetary conditions (Jordan 2015). Conditions are particularly challenging if the central bank is already operating at the zero lower bound and facing very low or even negative inflation (Bäurle and Kaufmann 2014). Habib and Stracca (2012) deliver a comprehensive empirical analysis of the potential fundamental determinants of safe-haven currencies. Except for a positive net foreign asset position, they fail to find robust evidence of the structural factors that might be common to currencies displaying safe-haven patterns during risk-off periods. They conclude that it is difficult to explain what determines the safe-haven status of a currency, perhaps because the motives and form of safe-haven demand, as well as the investors driving that demand, vary significantly across episodes (see also Habib and Stracca 2014). As a result, research has focused on the symptoms of flight to safe-haven currencies. The Japanese yen and the Swiss franc emerge from these studies as the most prominent safe-haven currencies. Ranaldo and Söderlind (2010) analysed the reaction of all major currencies to extreme events between 1993 and 2005, and showed that the yen and Swiss franc appreciated in a systematic way when risk peaked. Focusing on more recent risk-off episodes, De Bock and de Carvalho Filho (2013) found strong evidence for the same conclusion – returns on the yen and Swiss franc outperformed those of all other currencies when risk spiked. On the other hand, more mixed evidence was found by Grisse and Nitschka (2015). Even if the yen and Swiss franc are the first to appreciate in risk-off periods, we cannot conclude that the way this happens is the same for both, or that it always happens in the same way. While de Carvalho Filho (2015) found that Swiss franc appreciations during risk-off periods were accompanied by significant capital inflows, this view of the safe-haven mechanism has been challenged by others. Yesin (2016) concluded that there was no strong statistical relationship between the Swiss franc and contemporaneous capital flows. Botman et al. (2013) found that large movements in the yen valuation during risk-off episodes occur without any detectable movements in net capital flows. Exchange rate changes from offshore derivative markets can feed through to the spot market without any sizeable cross-border flows. The mechanics may also vary because the profile of the investors generating the safe-haven demand differs. Yesin (2015) suggested that between 2007 and 2011 the appreciation of the Swiss franc was largely due to a strengthening home bias among domestic investors. In contrast, Auer (2015) showed that, at the height of the European debt crisis in 2012, demand for Swiss franc was driven by non-residents seeking to increase their net franc positions. The triggers of the safe-haven phenomenon are also important. In recent research (Jäggi et al. 2016), we use high-frequency data to investigate the impact of macroeconomic surprises, the broader risk environment, and monetary policy on the yen and Swiss franc between 2000 and 2013. Safe-haven currencies systematically react to some macroeconomic surprises: negative (positive) surprises lead to an appreciation (depreciation) of these currencies;. On average, the yen and Swiss franc have stronger reactions to foreign than to domestic macro surprises. US macro surprises play a key role for both currencies. The yen is more sensitive to US macro surprises than the Swiss franc; the franc is more sensitive to European macro surprises. The sensitivity of safe-haven currencies to macro surprises could already be observed in the relatively tranquil period between 2000 and 2007, but was strongly magnified in the crisis. Coefficients are up to 20 times larger in post-2007 estimates. Interestingly, and precisely in the safe-haven spirit, this is true only for foreign macro surprises. We found an astonishing non-result. For European macro surprises, essentially only German data play a role. It might be rational for markets to focus on German surprises to assess European macroeconomic risks during tranquil periods, it is difficult to argue that this held throughout the crisis. As economic performance diverged across the Eurozone, and as some economies worried about debt sustainability, one might have expected macro surprises in countries other than Germany to influence currency markets. Instead, we found no evidence that macro surprises in Spain, Italy, France or Belgium have had any material relevance for the yen or the Swiss franc. Macro surprises maintained their influence on the yen and Swiss franc independently of the monetary policy stance. Their influence did not vanish after the adoption of a minimum-exchange-rate policy by the Swiss National Bank in late 2011, or after the implementation of a more aggressive quantitative-easing policy by the Bank of Japan in December 2012. We also investigated the role of macro surprises relative to the general risk environment. 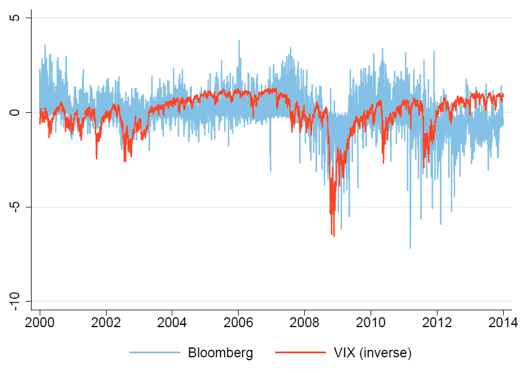 We used two measures of the general risk environment: the option-implied expected volatility of the S&P500 index (VIX) – by far the most popular proxy for uncertainty in global financial markets – and a news index constructed from a weighted balance of positive and negative news on the Bloomberg wires.1 Figure 1 compares normalised versions of the risk measures, which are highly correlated. At times, however, they strongly and persistently diverge. On average, increases in both measures of risk are associated with appreciations of the safe-haven currencies. The Bloomberg-based variable appears to be better than the VIX at capturing the effect of extreme risk conditions on safe-haven currencies. General risk fluctuations affect safe-haven currencies in addition to the effect of specific macro surprises. We find no evidence of an interaction between our general risk measures and macro surprises. The general risk environment and macro surprises thus appear to be distinct factors affecting safe-haven currencies. Our results show that macroeconomic surprises have been important drivers of safe-haven currencies. In particular, we find strong evidence of a pronounced impact of foreign macroeconomic surprises on these currencies during the recent crisis. Macro surprises have an effect that additional to the effect of fluctuations in the general perception of risk. We have also shown that an aggregate news index based on the Bloomberg wires provides a valuable alternative to the VIX as a measure of the general risk environment. This source is useful, because news can be filtered and aggregated flexibly, and so subsequent research may shed further light on the nature of the safe-haven phenomenon. Andersen, T G, T Bollerslev, F X Diebold and C Vega (2003), “Micro effects of macro announcements: real-time price discovery in foreign exchange”, American Economic Review 93(1). Auer, R (2015), “A safe haven: international demand for Swiss francs during the euro area debt crisis”, SNB Quarterly Bulletin No. 2. Bäurle, G, and D Kaufmann (2014), “Exchange Rate and Price Dynamics in a Small Open Economy – the Role of the Zero Lower Bound and Monetary Policy Regimes”, SNB Working Papers, No. 10. Botman, D, I de Carvalho Filho and R Lam (2013), “The Curious Case of the Yen as a Safe Haven Currency: A Forensic Analysis”, IMF Working Paper, No. 228/13. de Carvalho Filho, I (2015), “Risk-off episodes and Swiss franc appreciation: the role of capital flows”, German Economic Review 16(4): 439-463. De Bock, R and I de Carvalho Filho (2015), “The Behavior of Currencies during Risk-Off Episodes”, Journal of International Money and Finance 53: 218-234. Grisse, C and T Nitschka (2015), “On financial risk and the safe haven characteristics of Swiss franc exchange rates”, Journal of Empirical Finance 32: 153-164. Habib, M M and L Stracca (2011), “Getting beyond carry trade — What makes a safe-haven currency?”, VoxEU.org, 30 January. Habib, M M and L Stracca (2012), “Getting beyond carry trade — What makes a safe-haven currency?”, Journal of International Economics 87(1): 50-64. Habib, M M and L Stracca (2014), “Foreign investors and crises: There is no safe haven for all seasons”, VoxEU.org, 28 February. Jäggi, A, M Schlegel and A Zanetti (2016), “Macroeconomic surprises, market environment and safe-haven currencies”, SNB Working Papers, No. 15. Jordan, T (2015), “The impact of international spillovers on inflation dynamics and independent monetary policy: the Swiss experience”, 39th Economic Symposium on 'Inflation Dynamics and Monetary Policy', Jackson Hole. Ranaldo, A and P Söderlind (2009), “Safe Haven Currencies”, Review of Finance 14(3):385-407. Yesin, P (2015), “Capital flow waves to and from Switzerland before and after the financial crisis”, Swiss Journal of Economics and Statistics 151(1): 27– 75. Yesin, P (2016), “Capital Flows and the Swiss Franc”, SNB Working Paper, No. 8. A negative (positive) Bloomberg index value implies that negative (positive) news dominated on the day, defining a risk-off (risk-on) environment.